Visually appealing and simply delectable, succumb to Long John Silver’s irresistible new Silver’s Fish Supreme ($4.95). Baked Ciabatta bread, crunchy lettuce and crispy Pollock Fish fillet with a generous serving of creamy dill sauce formed the delicacy pleasing to the most refined palate. It is so delicious that you will get addicted after the first try. 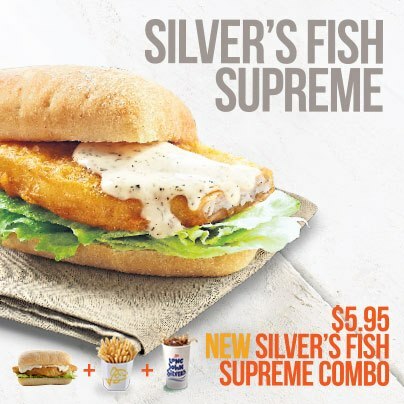 Best of all, top up an additional dollar for the the ultimate new Silver’s Fish Supreme Combo which consists of the Silver’s Fish Supreme, crispy fries and a regular drink. Eat to your heart's content and indulge in the awesome aroma and flavour like never before. Excellent atmosphere and customer service made the overall dining experience a very enjoyable and pleasant one.